In 1937 Walter Blackett is the owner of a large rubber plant and export firm in Singapore where he lives with his wife Sylvia and their three children. Monty, the eldest, is immature and not a businessperson type of guy, while Joan, beautiful and well-educated, tends to be attracted to unsuitable men. The youngest, Katie, an interesting adolescent, is growing up a tad fast. Mr. Webb was Blackett’s business partner for many years but is now old and in poor health, dying actually. His wife is deceased and their only child, Matthew, is an idealistic wandererwhen the book opens. Major Brandon Archer (from Farrell’s Troubles) is a middle-aged single man who is employed by Webb. His name, Major, was his rank in the Great War and it stuck. The time frame is pre-WWII, 1937-194 – Japan is at war in China, England is at war in Europe and there are Communists and Malayan Nationalists and other factors to contend with. The background deals with the build-up to England’s worst military defeat in WW2. Walter Blackett is an old-school Englishman who still lives and believes in the capitalism and the imperialism of the dying British Empire, for Singapore, for the world. Actually, this is the crux of all three books in Farrell’s trilogy. Singapore has changed dramatically over the decades been there and Walt’s not altogether pleased although he does like the business opportunities and always puts them first. On the downside in this book, there is quite a lot of anti-imperialist/capitalist Empire, more than in either of the other books in the trilogy. Farrell feels just a tad angry. I might love it for the historical aspect (not the polemic) if I hadn’t expected something different. But that’s likely the point, the businessmen of Singapore are far more concerned about protecting their investments than about the Empire as a whole – and this might be true of all English businessmen. As a result Walter and his kind think it is pure ineptness on the part of England not to send the best men and equipment they have to fight in Malaysia (never mind Hitler). Malaysia is only a money-maker for the English businessmen, there is no sense of national pride at all in large part because of the huge variety of immigrants from China and elsewhere. This makes for a cheaper labor force. Planting new rubber trees is considered an investment the cost of which is supplying the British and Americans with sorely needed rubber now – too bad, the taxes are too high. There is also a certain amount of the usual corruption going on and the book is probably not too far off the mark from what goes on today. But Walter is temporarily blinded by profits and can’t see the realities of the international situation. Joan is stalking Matthew who is being courted slyly by Vera Chiang who Webb’s companion but, it seems, has her own ideas for now. And an old buddy of Matthew’s Ehrendorf is smitten by Joan while Monty, her brother, just chases the parties. Major Archer is lost – embroiled in a Chinese scheme and missing his Irish ex-girlfriend. There are a plethora of other characters, schemes and plot lines, a few too many, in my opinion. But the last half or so is a page-turner ad you wonder who will survive. 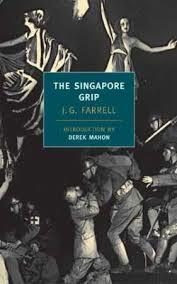 And what exactly is the “Singapore Grip?” No one seems to know for sure but there are plenty of opinions ranging from some kind of disease to a prostitute’s trick to the economic entanglement of the British. Take your pick – it could be one, none or all of the above – maybe something entirely different. Overall, it’s a good book, a nice ending for Farrell’s trilogy with the Empire crashing down in all it’s capitalist ruins. The humor, so amazing in the first two books, is not as prevalent and the satiric jibes at the British Empire not as subtle. I’d say read the books in order, but it’s not necessary. The first two won Booker prizes (Troubles retrospectively) but not The Singapore Grip.